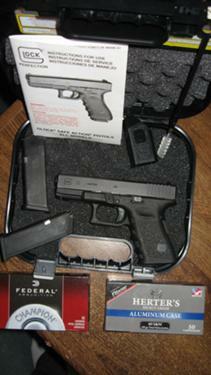 For Sale: My Glock 23 40 Caliber. Reason for selling is I hardly ever shoot it anymore. Comes with Owners manual, 2 Factory 13 round magazines, 1 factory speed loader, factory box, and Glock factory cleaning rod and brush. This gun has't had many rounds through it, less than 400, and I have just cleaned it. I'm also including 2 boxes of ammo (100 rounds total) one is Federal 180 grain brass case FMJ the other is Herter's (Blazer) 165 grain aluminum case, nylon coated bullets for cleaner firing. Asking $400.00 O.B.O Cash ONLY!! This gun must be transferred. Buyer pays all Transfer Fees. Call or Text Tyler @ 724-762-4032 for the fastest response.